Follow these steps to perform a clean installation of macOS Sierra 10.12 on your ThinkPad X220 or X220 Tablet with an Intel Core i3, i5 or i7 CPU. Most macOS Sierra features are fully functional on the ThinkPad X220. See the Not Functioning section of the Notes and Suggestions at the bottom of this page for the latest status. 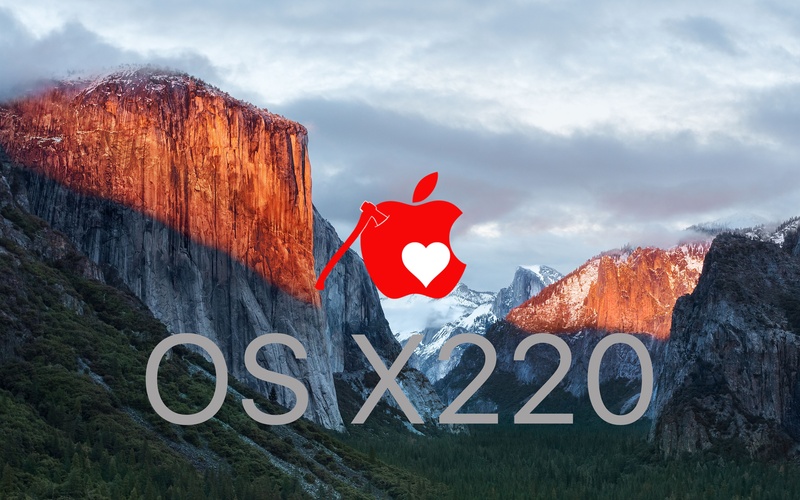 If you already have OS X 10.11 El Capitan or OS X 10.10 Yosemite on your X220 we recommend a clean installation of macOS Sierra, not an update from the existing installation. See the guide here to install OS X 10.11 El Capitan on the ThinkPad X220. 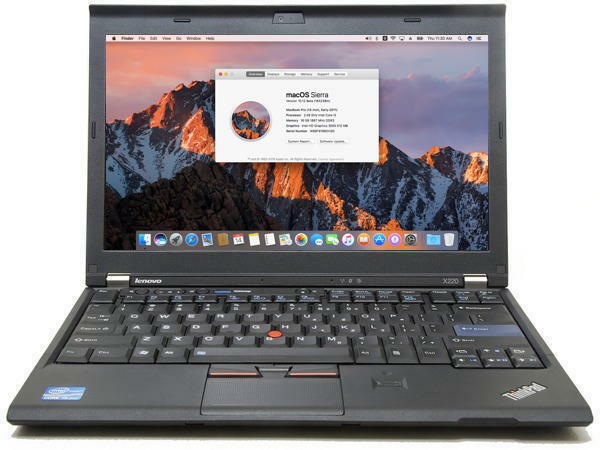 See the guide here to install OS X 10.10 Yosemite on the ThinkPad X220. See the guide here to dual-boot macOS and Windows. Please use our contact form if you find anything that isn’t accurate. Install the modified BIOS version 1.46 to remove the whitelist check and permit the installation of a Wi-Fi card compatible with macOS. This modified BIOS will also enable advanced settings and improve battery life under macOS. – To install this modified BIOS from a bootable USB drive, see the instructions here. – Please note the warning on the Advanced menu in the BIOS: Setting items on this screen to incorrect values may cause the system to malfunction! The default values will work fine but the wrong settings can prevent your X220 from booting. For 802.11ac + Bluetooth as well as Continuity/Handoff support, it may be possible to make the AzureWave AW-CE123H (aka Dell DW1550) card work by following the steps in the guide here. Another guide that might be helpful is available here. Note that it will not be possible to boot from our standard USB installer with this card installed; only install this card after the macOS installation is complete and the necessary modifications have been made. 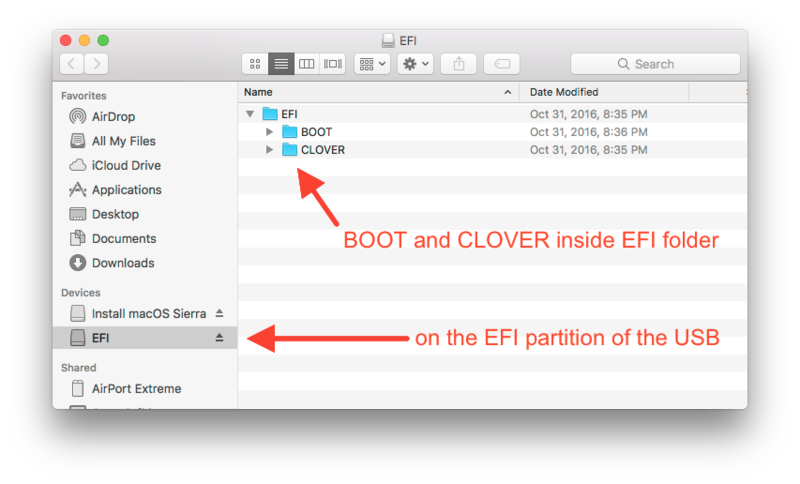 Quit Clover Configurator and copy the entire EFI folder from the Utility and Kext Pack to the EFI partition of your USB, replacing the existing folder if present. The computer will eventually restart. When it does, press F12 to select the USB as your boot disk and then select Boot macOS from Macintosh HD at the Clover bootloader menu. 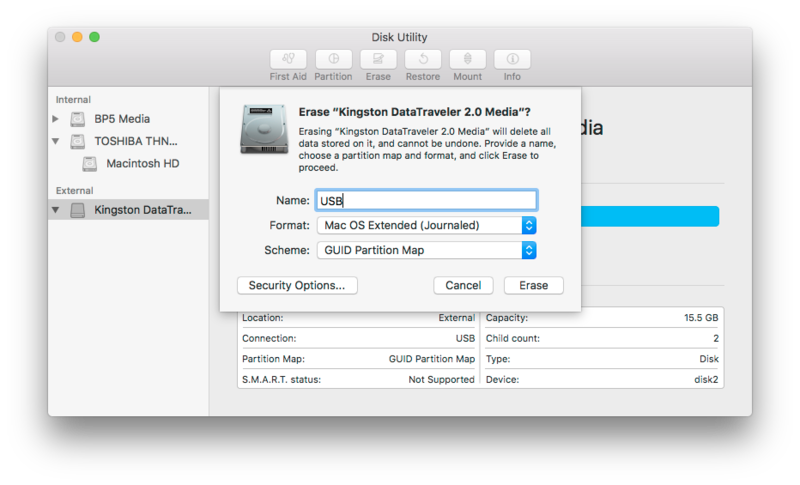 Complete the guided macOS setup but do not turn on FileVault Disk Encryption – this will prevent the computer from booting. 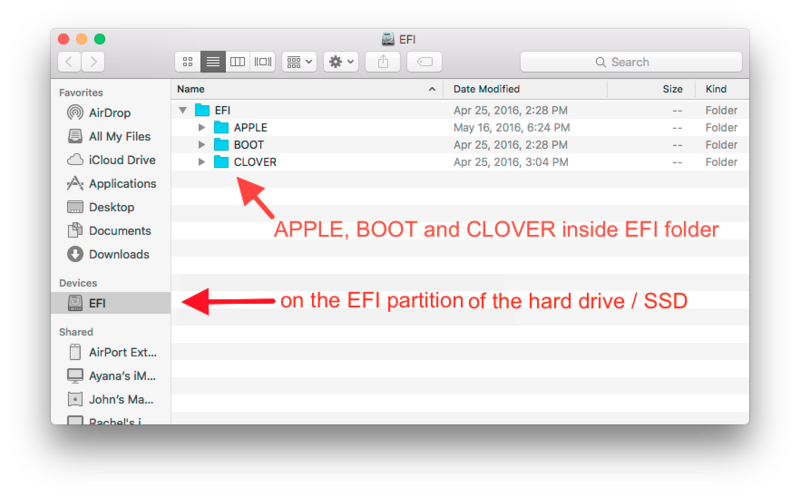 Copy the folders named BOOT and CLOVER from the EFI folder in the Utility and Kext Pack to the EFI folder on the EFI partition of Macintosh HD. Do not encrypt your boot drive with FileVault. Doing so will prevent the system from booting correctly. Keep your installation USB on hand. After installing macOS system updates it is sometimes necessary to boot the system with the USB and re-install kexts to get everything working properly again. Using Clover Configurator to edit the default config.plist is not recommended. This program will automatically and without warning makes changes to the default settings in the <key>ACPI</key> section that will prevent the system from booting. If edits are needed, open config.plist with TextEdit and follow the format explained here. If a kernel panic occurs, boot from the installation USB, select the installation drive, hit the space bar and select Boot Mac OS X in safe mode to successfully boot and make necessary changes. USB adapters for wireless mice or keyboards may trigger a restart when attempting to shut down. The only known solution is to remove the USB adapter before shutting down. If you are encountering a black screen when waking from sleep, add darkwake=8 to the Arguments section of the Clover config.plist. Edits to the Clover config.plist can be made using the TextEdit application and following the format explained here. If you are seeing duplicate entries for your macOS drive in the Clover menu, this means the installer may have created a logical volume. This can be reverted back to a physical volume by following the simple steps here. Touchpad and TrackPoint use a version of RehabMan’s VoodooPS2Controller.kext modified by tluck for the ThinkPad T420 in the guide here. Turn off the touchpad with the <PrtSc> key if you will only be using the TrackPoint – this will prevent an issue with unintentional double-clicks with the TrackPoint buttons. Touchpad supports three-finger swipe right and left (forward and back) in Finder, Safari and other browsers as well as three-finger swipe up for Mission Control and three-finger swipe down for App Exposé. TouchSierra written by jakibaki. Jakibaki’s script also adds some gestures including swipe from top to get Mission Control, swipe from bottom for Launchpad and swipe from left/right to switch workspaces. NewTouchSierra written by Jpeezzy. Jpeezzy’s script enables additional touch input and supports click and drag functionality. If screen brightness controls are not working, remove AppleBacklightInjector.kext from /Library/Extensions, run Kext Utility and then restart the computer. If you continue to encounter problems with brightness control, try creating a version of AppleBacklightInjector.kext customized for your hardware configuration using the script available from RehabMan here. If an external monitor is not automatically detected, open System Preferences > Displays and press the Option key (the <Windows> key on the X220 keyboard). This will show a Detect Displays button which should make the external monitor show up immediately. External monitors connected to the VGA port should be connected and powered on before booting the computer. If an external monitor is attached to the VGA port and the internal display remains dark, try increasing brightness with the <Fn>+<Home> keys. To enable Night Shift, run macOS Night Shift Enabler.mpkg located in the Utility and Kext Pack. Original source is here. To enable USB 3.0 on Core i7 X220 systems, download GenericUSBXHCI.kext here and place in /System/Library/Extensions and on your EFI partition in EFI/CLOVER/kexts/Other. Then run Kext Utility to repair file permissions and rebuild the boot cache. To enable docking station headphone and microphone ports, use the alternate AppleHDA_20672.kext available here. Simply place this alternate version in Utility and Kext Pack > EFI > CLOVER > kexts > Other and repeat steps 28-30 above. Note that the combo audio jack on the right side of the computer will not function correctly with this alternate AppleHDA_20672.kext – we are working on a solution to this. Time Machine can be used to back up and restore your X220. Complete the restore process by booting from the installation USB and repeating steps 24 – 27 (and optionally step 32) to restore the contents of the EFI partition. SuperDuper is another good backup solution. If the Bluetooth radio is turned off in Windows or Linux it may no longer show up when booting into macOS. Boot back into Windows or Linux to turn the Bluetooth radio back on. macOS Sierra Update 10.12.6 – installs with no issues. If you previously enabled Night Shift, it will be necessary to enable it again. macOS Sierra Update 10.12.5 – installs with no issues. If you previously enabled Night Shift, it will be necessary to enable it again. macOS Sierra Update 10.12.4 – installs with minor issues. Download the current Utility and Kext Pack and repeat steps 25-33 to correct an issue with screen brightness control. Be sure to first backup your Clover config.plist if you made any changes to the default version. Note: If you continue to have trouble with screen brightness control, see the suggestions in the Video / Displays section of the notes at the end of the guide. macOS Sierra Update 10.12.3 – installs with no issues. macOS Sierra Update 10.12.2 – installs with no issues. macOS Sierra Update 10.12.1 – installs with no issues. This update resolves the issue with the keyboard volume increase/decrease buttons. 07/04/2017: Updated Utility and Kext Pack with new versions of Clover, Clover Configurator and installer to enable Night Shift. 05/15/2017: Updated Utility and Kext Pack with modified VoodooPS2Controller.kext with improved gesture support (thanks to Henry López del Pino), new dsdt.aml for better fan speed regulation, as well as newer versions of Clover and Clover Configurator. 04/09/2017: Updated Utility and Kext Pack with new dsdt.aml and AppleBacklightInjector.kext for better range of screen brightness as well as improved kext installation script and new version of Clover Configurator. 03/27/2017: Updated Utility and Kext Pack with AppleBacklightInjector.kext to fix brightness control issue with 10.12.4 update as well as newer version of Clover and Clover Configurator. Removed obsolete IntelBacklight.kext. 01/23/2016: Updated Utility and Kext Pack with BlueTooth_Injector.kext to fix BlueTooth on/off functionality, new version of VoodooPS2Controller.kext and latest Clover Configurator. Removed obsolete BroadcomBluetooth.kext. 12/29/2016: Updated Utility and Kext Pack with new version of VoodooPS2Controller.kext that improves middle button function, gestures and fixes <Fn>+<Home/End> to adjust screen brightness. Also updated FakeSMC.kext as well as various Clover bootloader files. 11/26/2016: Updated Utility and Kext Pack with new versions of Clover Configurator and the following kexts: ACPIBatteryManager, FakeSMC, IntelBacklight, IntelMausiEthernet, VoodooPS2Controller. No significant changes or improvements. 11/12/2016: Updated Utility and Kext Pack with new version of VoodooPS2Controller.kext that corrects <CapsLk> issue. 11/03/2016: Updated Utility and Kext Pack with new version of VoodooPS2Controller.kext that corrects numerous Trackpad issues. Removed steps for installing the now-obsolete patched Trackpad prefPane. A stock unmodified macOS Sierra Trackpad prefPane is available here if you previously installed the patched version in System/Library/PreferencePanes. 09/25/2016: Updated Utility and Kext Pack with new version of Clover Configurator. Added post-install step to enable apps downloaded from unidentified developers. Independent reviews of the best ergonomic mice, keyboards, standing desks and alternative devices. Proceeds support the Purple Maiʻa Foundation technology education nonprofit.